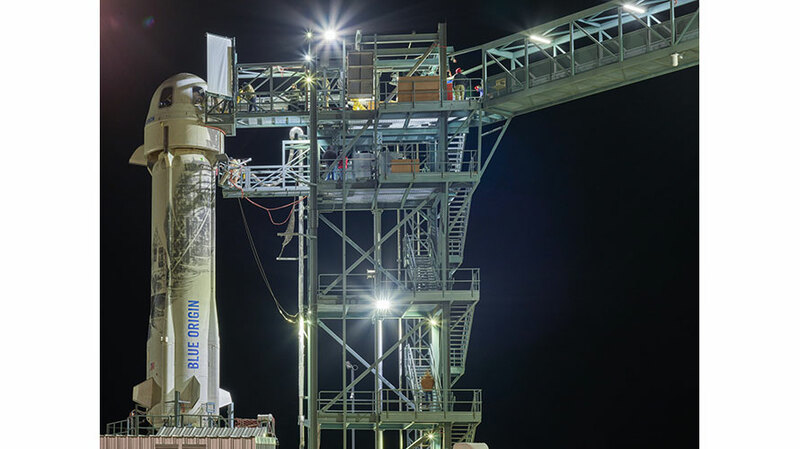 Image: New Shepard flight NS-10 on the launch pad the morning of January 23rd, 2019. Courtesy Blue Origin. Blue Origin successfully launched the New Shepard suborbital rocket and uncrewed capsule to space today Wednesday January 23rd, and re-landed both safely and successfully at their West Texas facility. This was the tenth flight in its ongoing test program, thus named flight NS-10. It was the fourth flight and reuse of this particular New Shepard vehicle, the NS3, and the uncrewed passenger and payload capsule topside called Capsule 2.0. Launched at 9:05 am CST, flight NS-10’s capsule reached an apogee of 350,775 feet, or 66 miles (107 km), after a little more than 4 minutes of flight. This altitude is just beyond the Karman Line boundary of space considered to be 100 km or 62 miles. During ascent a maximum speed of 2,226 mph and 3-Gs were attained, followed by three to four minutes of microgravity flight for the payloads in the capsule. Subsequently the booster touched back down vertically on its landing pad after 7 and a half minutes, followed by the soft landing of the capsule, assisted by parachutes and small rocket motor firing, after a total of 10 minutes and 15 seconds of flight. A video of the flight may be seen at: https://www.youtube.com/watch?v=OOj1rDshvWo. Most importantly these test flights are necessary to prove out the New Shepard system for suborbital passenger flights to space. While designed to carry six space tourists at a time, the capsule used in NS-10 will be repurposed in the future solely to carry payloads, as described by Ariane Cornell, Blue Origin Director of Astronaut Strategy and Sales. While narrating the flight live she revealed that a second New Shepard booster, NS4, which will carry the next man-rated 6-passenger capsule is in vertical preparation at the West Texas facility. It would seem, then, that one or more uncrewed test flights of the new NS4 booster and capsule will have to be made this year prior to their first human flight. While a flight with Blue Origin staff may take place late this year, it seems likely that New Shepard flights with space tourists will happen sometime in 2020, perhaps early in the year. Blue Origin has not yet announced a ticket price nor started ticket sales. The previous New Shepard test flight, NS-9, took place this past July 18th, 2018. While also carrying payloads from paying customers, the prime objective was to test the capsule’s solid fuel escape rocket motor. Like today’s flight, that flight was also wholly successful. The Blue Origin space development company was founded and has been funded by Amazon founder and CEO Jeff Bezos. Meanwhile, Virgin Galactic, founded and funded by Sir Richard Branson, is also in the startup suborbital space tourism business. Just six weeks ago, Virgin Galactic successfully launched their VSS Unity space plane, with pilot and co-pilot on board, which crossed the lower boundary of space at 50 miles altitude by reaching an apogee of 51.4 miles before gliding back to a smooth landing at the Mojave Air and Space Port in California. It is expected that 2019 will see Richard Branson fly to space aboard VSS Unity. Which company first flies paying tourists to space is at this point mostly a guessing game. About 600 people have so far committed to fly with Virgin at a ticket price of $250K. This year and next are indeed exciting years to watch this business develop. It seems likely that once actual suborbital tourist flights start, ticket sales for both companies will ramp up. Over time, competition should lead to lower ticket prices and increased passenger traffic. The sub-orbital tourist experience will create a customer base primed for the next step—orbital tourism—once the Dragon 2, Starliner, and future capsules for the Blue Origin New Glenn reach maturity.